Texas A&M punter Braden Mann was named the Southeastern Conference's Special Teams Player of the Year as voted on by the league's head coach, the conference office announced Wednesday. 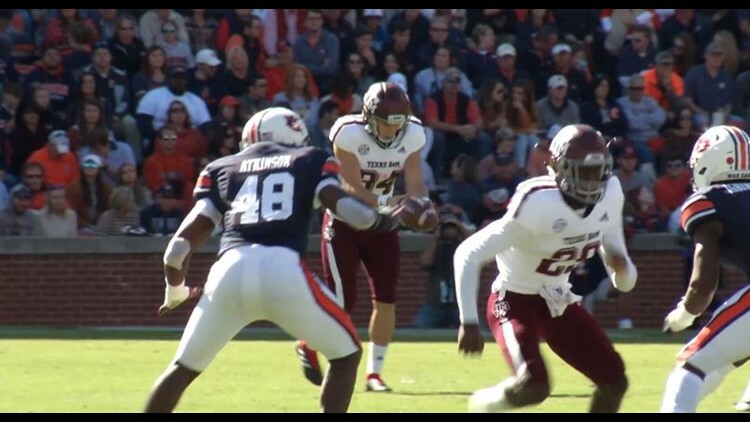 BIRMINGHAM, Ala. – Texas A&M punter Braden Mann was named the Southeastern Conference's Special Teams Player of the Year as voted on by the league's head coach, the conference office announced Wednesday. Mann is on pace to break his third NCAA record of the season as he leads the country with a 51.15 punting average and is nearly a yard ahead of Chad Kessler's mark of 50.28 set in 1997. In September at No. 1 Alabama, Mann broke the NCAA record for the high gross punt average in a single game at 60.8 yards on five boots, breaking the old record of 60.4 which was set originally in 1983 and matched in 2010. Against UAB, Mann uncorked his 14th 60-yard punt of the season, breaking Wake Forest's Ryan Plackemeier's record set in 2005 for the most 60-yard punts in a single season. Texas A&M's punting unit leads the FBS in net punting at 45.0 yards and could become the first team since BYU in 1983 to average 45.0 or more net yards per punt in a full season. Only one team in FBS history that does not play home games at altitude has averaged over 45.0 net yards per punt – Southern Miss in 1972, led by legendary punter and award-namesake Ray Guy. Texas A&M returns to action December 31 at 6:30 p.m. as the Aggies take on North Carolina State at the Taxslayer Gator Bowl in Jacksonville, Fla. Tickets for the game can be purchased online at www.12thMan.com/bowltickets.